Considering that it's a Hollywood film centred around an American merchant vessel being hijacked by Somali pirates, and the efforts of its captain (Tom Hanks) to keep his ship and his crew safe, it's gratifying to see that Captain Phillips isn't purely an exercise in American exceptionalism. There are elements of that inherent to the story, and they only become more pronounced once the Navy are brought in to resolve the situation by whatever means necessary, but there's little triumphalism in Paul Greengrass' (The Bourne Ultimatum) film. Though it has some geo-political resonance, it's primarily an examination of a clash between two captains, Philips and Muse (newcomer Barkhad Abdi) that is firmly grounded - or, perhaps more appropriately, anchored - in their shared humanity. Based on a real incident in which the merchant freighter Alabama was hijacked in 2009, Captain Phillips establishes from its first two scenes that Greengrass and his screenwriter, Billy Ray, have sympathy for both Philips and Muse, even though their interaction will ultimately cast one as the antagonist. As Philips drives from his Vermont home to the airport with his wife (Catherine Keener), he talks about how worried he is about his son's future, and about how he'll be entering a job market in which fifty qualified guys compete for every job. The film then cuts to a village in Somalia where Muse assembles his crew by picking three men from a huge crowd. It's an admittedly on-the-nose way of equating the two characters and their situations, but its crudeness doesn't make it any less effective. Similar moments throughout show that Philips and Muse are both capable, intelligent men who know their job, but one works for a huge company and the other for a Somalian warlord. They're both middle managers, but one happened to be born in part of the world with ample opportunity, the other in a place where fishing and piracy are the only viable options for survival. The scenes establishing who Muse is and where he is from are very brief, and once the pirates take the Alabama the film becomes preoccupied with their conflict, rather than its causes, but it's enough to establish that while Muse is doing something illegal and dangerous, he's doing it for understandable reasons. It's that nuance, limited though it may be, that makes Captain Phillips so gripping. Greengrass and Ray display tremendous empathy for everyone involved, depicting them as desperate men trapped in a difficult situation. It's not simply a case of good, decent Americans being attacked by unscrupulous pirates; both crews are depicted as being, at heart, cantankerous men who are just trying to do their jobs, with Phillips and Muse standing out as the most capable men on either vessel. Because we understand where both sides are coming from - the men of the Alabama just want to get it over and done with without losing their lives or the ship, while the pirates desperately need to come away with something valuable to show their bosses - it makes the conflict more compelling than if it was simple case of heroes and villains. There is a villain in the form of Muse's unpredictable second-in-command Bilal (Barkhad Abdirahman) but he's far from evil; he's just more volatile than everyone else. The cat and mouse game that ensues is so engrossing because the film makes it harder to root against one side in favour of the other. 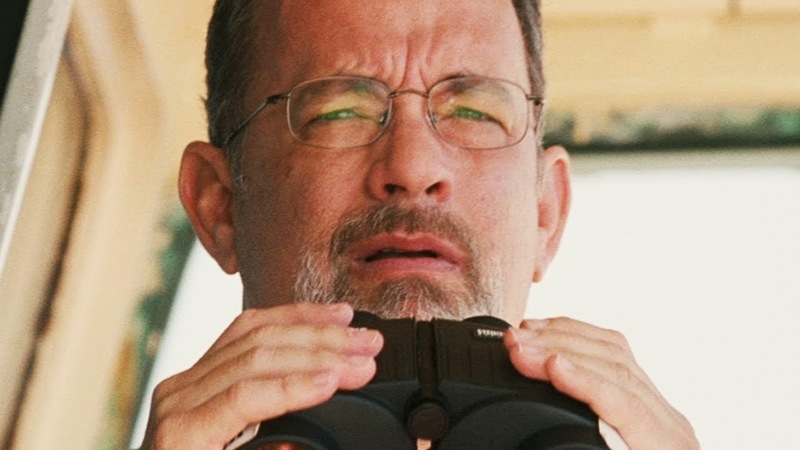 Though sympathy ultimately lies less with the crews than with their leaders: Captain Phillips has a pretty large cast and an impressive sense of scale, but it's ultimately about two men staring each other down. Hanks and Abdi are exemplary as those two men since they ground the political and social commentary in a believable dynamic. Hanks is good at being steely-eyed and stoic, but the real power of his performance lies in the film's harrowing final half hour. As the endgame of the hijacking grows rapidly closer, as the Navy close in and the pirates get ever more nervous, he gets to play fear and trauma with a level of intensity that I haven't seen him display before. His performance as a whole might not veer much from the established Tom Hanks persona, but his final few scenes are some of the best work of his career. Abdi's work is even more impressive, both because he's a new, young performer, and because he has to repeatedly threaten one of America's most beloved actors without losing the audience's sympathy. Not an easy task, but he makes it look effortless. Captain Phillips is a terrific thriller that manages to blend its political subtext with character development, rather than grafting characters onto politics (as happened with Greengrass' previous film, the incredibly muddled Green Zone), and which combines a lean story with Greengrass' typically visceral, intense style. Most importantly, it's a tale of two captains trying to survive in an unequal, chaotic world that forces them together, and what happens when decent men are forced into conflict because of where they happen to come from.